This free class is full of fascinating information, tips, and practical resources for anyone who is curious about Crystal Skulls, their history, and how to use them. You'll learn why Crystal Skulls were so important to the ancients and how they can be utilized today for divination, healing, and communication with the Other World. Your instructor, Joseph Mancini, Jr., Ph.D., CCHt., shares what he has learned about the general history and nature of Crystal Skulls and how he uses them to help individuals gain clarity about the challenges they face and how to meet those difficulties productively. 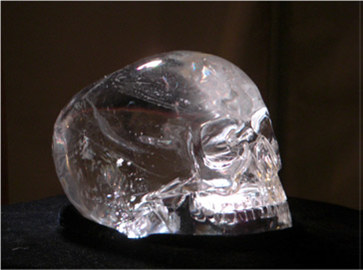 During the past several years, Dr. Mancini has talked about Crystal Skulls on public radio, has given day-long, in-person classes on Crystal Skulls, and has delivered countless Crystal Skull readings at psychic fairs and expos and in his home office. PLUS: The ebook provides information about where you may confidently purchase Crystal Skulls online, as well as a bibliography that includes books on crystal skulls, novels involving crystal skulls, and videos about them. Dr. Mancini specializes in spiritual hypnotherapy (e.g.. Past-Life Regression, Future Progression, accessing Counterpart Selves and Parallel/Probable Selves, Life-Between-Lives Hypnotherapy, and Hypnotic Dreamwork). He is also an NLP practitioner, an executive coach, and a corporate trainer in leadership development.